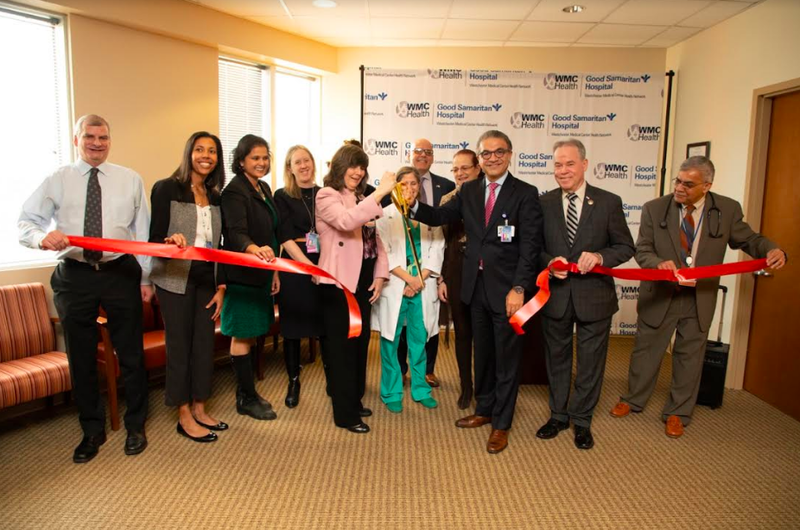 SUFFERN, N.Y. — The Westchester Medical Center Health Network (WMCHealth) today announced the launch of Institute for Women’s Health and Wellness services at Good Samaritan Hospital, a member of WMCHealth. This comprehensive network-wide service is devoted to providing women living in and around Rockland and Orange counties, and throughout the Hudson Valley, with high-quality, comprehensive, multidisciplinary care as close to their homes as possible. The Institute for Women’s Health and Wellness will in time deliver to Hudson Valley families the convenience of women’s health services at Good Samaritan Hospital and other WMCHealth hospitals across the region with the seamless, integrated support of advanced care services at the network’s flagship Westchester Medical Center. Women’s health specialties and services available through WMCHealth’s Institute for Women’s Health and Wellness include general gynecology and advanced gynecologic surgery; robotic and minimally-invasive surgery; high- and low-risk obstetrics; breast surgery and three-dimensional mammography; high-risk cancer screening; gynecologic oncology; urogynecology; menopausal health plus an overall wellness and prevention program. At Good Samaritan Hospital, partnering under the banner of the Institute for Women’s Health and Wellness will be Sushil Bhardwaj, MD, Medical Director of the Bobbi Lewis Cancer Program; Karen Karsif, MD, FACS, Director of The Center for Breast Health; John Rescigno, MD, Associate Director of Radiation Oncology; and Patricia Pollio, MD, Director of OB/GYN. The Good Samaritan Hospital women’s health specialists will be bolstered by the support of Dr. Tedjarati along with three Westchester Medical Center specialists: Tana Pradhan, DO, Chief, Gynecologic Oncology and Robotic Gynecologic Surgery; Gizelka David-West, MD and Cara Grimes, MD, Chief of Advanced Urogynecology, Female Pelvic Medicine and Reconstructive Surgery…Each now provides on-site consultation and follow-up services at Good Samaritan Hospital. In addition to primary, secondary and tertiary care, the Institute for Women’s Health and Wellness places an emphasis on preventative medicine through nutrition and general health counseling. It also incorporates holistic principles in the care process, along with stress management and family history analysis to optimize patient health. Additionally, with Westchester Medical Center’s status as an academic institution, patients have the opportunity to be at the forefront of medical advances through clinical trial research. “At Good Samaritan Hospital, we are pleased to be a part of the WMCHealth Institute for Women’s Health and Wellness, offering specialized services to the women of our community,” said Mary Leahy, MD, CEO, Bon Secours Charity Health System. “There is a need for a defragmented and comprehensive continuum of care for women through all stages of their lives,” Leahy said. “Our physicians now have the opportunity to collaborate on patients’ diagnosis, refer patients more easily and discuss possible treatments. “Our goal is to have women stay in our community for their healthcare, and we now have an exceptional academic facility, Westchester Medical Center, collaborating with Good Samaritan Hospital to improve the quality and scope of women’s healthcare,” said Leahy. Those interested in learning more about the services offered by the WMCHealth Institute for Women’s Health and Wellness services at Good Samaritan Hospital should call (845) 288-1100.